Although it might not be obvious to the casual listener, not all radio stations are created equal. There are two distinct kinds of radio stations: commercial radio and non-commercial radio. The differences between these two types of stations come down more than just formatting. Commercial radio derives its operating budget from selling advertising. Since they attract those advertising dollars based on ratings, commercial radio stations need consistently large numbers of listeners. These ratings are used by the station to demonstrate to potential advertisers that buying a commercial spot on the station will reach a significant number of people and is a worthwhile investment. These numbers are also used to price advertising. The more listeners a station has, the more it can charge for ad spots and the more money it will have in its operating budget. 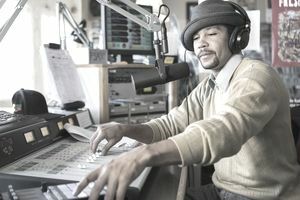 Non-commercial radio, also called non-comm for short, includes college radio and community-based radio stations, including local National Public Radio (NPR) affiliates. Though these stations may carry advertising, it is widely spaced and not the main source of station funding. Most non-commercial stations rely either on subsidies from a nonprofit such as a university or listener contributions for their income. Commercial stations don't have the same kind of freedom in what they play as non-commercial radio. They want to play music by musicians who are playing shows in that station's market and have national name recognition. In fact, they need to play music that fits these criteria to get the ratings they need. Will the song be available to purchase both digitally and in local stores? Will there be national and local reviews for the song/album? Will the artist be playing locally? Will they be available to the station for interviews/on-air performances? Will there be local advertising? Will the song be involved in any national media campaigns, films, television shows or other media? The more the exposure to the song, the more the station will be convinced that playing it will increase their ratings since it will be familiar to their listeners. For these reasons, commercial radio stations are not usually the first entry into the world of radio musicians. Many up-and-coming musicians don't have the budget or the reach to meet the demands of commercial radio stations. As someone promoting to radio, the distinction between commercial radio and non-commercial radio comes down to much more than a barrage of ads between song plays. From a promotion standpoint, you have to approach these stations in different ways, and usually at different stages in your career. Non-commercial radio tends to have a lot more flexibility in their playlists. You're more likely to hear music from up-and-coming and non-mainstream artists on non-commercial radio. They're able to be flexible because the non-commercial model doesn't rely on advertising dollars, and isn't dependent on ratings. Commercial radio stations need to show good ratings to convince advertisers to spend money. By playing new or non-traditional artists, non-commercial stations are usually giving their audiences exactly what they want. It's a self-reinforcing cycle that works in favor of indie music. Non-commercial radio stations may also focus on niche genres of music. It is especially true of community radio stations, which may, for instance, only play jazz or folk music. In addition to playlist flexibility, non-commercial radio is a great entry point for many musicians because there is less competition. Major labels tend to ignore non-commercial stations, which means radio promoters have an easier time getting the radio staff to check out new promos.